This variety is originally from the Western Pyrenees. In France, Manseng noir N is officially listed in the "Catalogue of vine varieties". 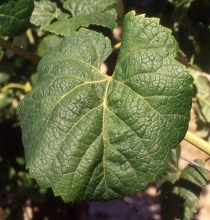 Manseng noir N is a vigorous variety, low fertility of vine eyes at base, which must be long-pruned. However, if managed, this variety can produce high yields. Adapts well to various soil types. This variety would appear not to be particularly sensitive to diseases and pests. 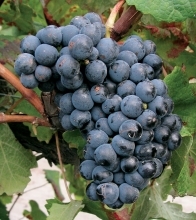 Grape clusters are moderate to large, fairly loose and the berries are small to moderate size. Manseng noir produces extremely colorful wine with a beautiful dark ruby color. Astringent wine, slightly acidic but fine and capable of ageing; interesting for blending purposes. The only approved Manseng noir N clone carries the number 897. When well-managed, this clone produces very colorful and full-bodied wines, distinctive of this grape variety.